Now in its 12th year, CRM Evolution continues to be the perfect opportunity for you to share the many ways your company’s products and services can benefit attendees. Take advantage of unique opportunities to connect with top decision makers who are seeking information and are ready to buy. Attendees are looking for ideas, strategies, and technologies to create great customer experiences, improve customer satisfaction and loyalty, streamline business processes, increase profitability, and more. As a sponsor of CRM Evolution, you can bring your solutions to these potential customers. A platinum or gold sponsorship at CRM Evolution 2017 marks your company as an industry leader and offers you a unique opportunity to brand and communicate your company’s image with sales, marketing, and customer service executives. CRM Evolution 2017 offers an affordable way to reach decision makers who are seeking information and who are ready to purchase solutions. Don’t miss this opportunity to get your products and services in front of this senior-level, targeted audience. 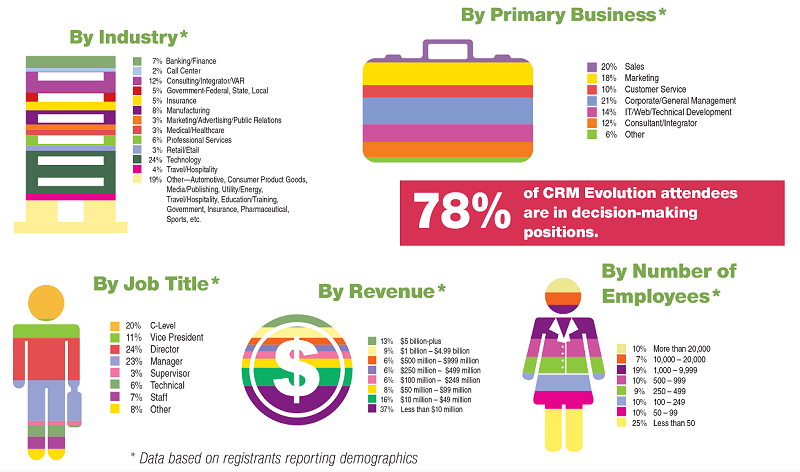 CRM Evolution 2017 is supported by an extensive marketing plan that includes focused promotion via direct mail, print, email, social media, web advertising, and a successful PR campaign, built on the solid foundation of CRM magazine’s readership base and the CRMEvolution.com website’s wide reach.